先來討論一下 Minimal Install 可以使用 VNC 嗎? 我們得先了解 X-Window 的運作方式, X Server 負責顯示介面與繪圖,並將使用者的輸入行為告知 X Client,而 X client application 則是負責產生繪圖的數據並回傳給 X Server,通常我們的 dispaly server 和 client application 都是在同一台電腦上面. 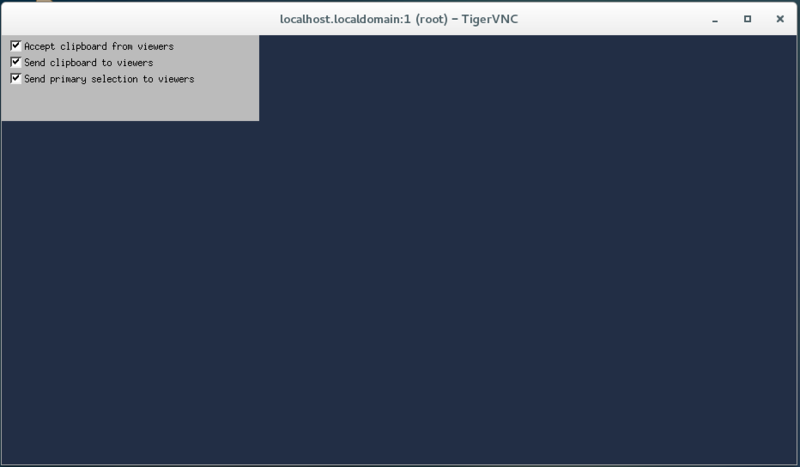 再來安裝 CentOS 7 所使用的 TigerVNC.這跟之前使用的 VNC http://benjr.tw/715 不太一樣. localhost.localdomain:1 (root) 的意思是說,啟動一個 VNC 在 port 5900+1 即 5901 , vncviewer 可以透過這個埠連線,使用者為 root. 的確在 0.0.0.0:5901 已經開啟 VNC ,這時候就可以透過 vncviewer 去與遠端連線了.VNC 連線後等左上方的顯示訊息跑完就可以看到遠端桌面. 如果只是想要單純把 Linux X-window 的程式執行畫面傳過來,其實透過 SSH + X11 forwarding – http://benjr.tw/3285 就可以了.